There were a number of new walls that were built as part of our renovation, and the week or so that the drywallers are around was a very dramatic one. 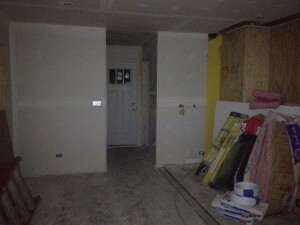 They move very quickly and did a very good job with all the walls and ceilings. Before any drywall went up, the walls were insulated. Building code in Evanston is much more stringent on insulation than when the house was built in the ’60s, so we had 6″ studs on the outside walls and ceilings. 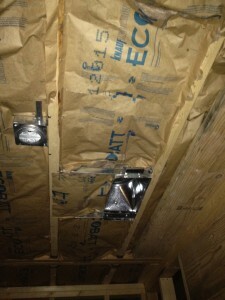 I believe the current code calls for R-38 on ceilings and R-20 on walls, and ours were definitely stuffed. All holes were sealed beforehand and even before the insulation was installed we could feel the retained heat in the (at that time) unheated top floor from the downstairs heat. Now that we are in the summer months, on hot days that previously would have resulted in a sweltering upstairs room we haven’t even had to turn on the A/C. 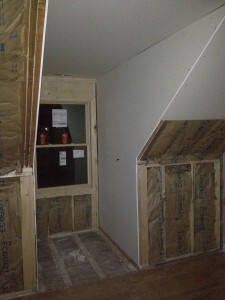 The drywall went up over the insulation in just a matter of days. The drywallers also primed all the walls which allowed them to find any rough spots or gaps in the joint compound applied to all the seams. 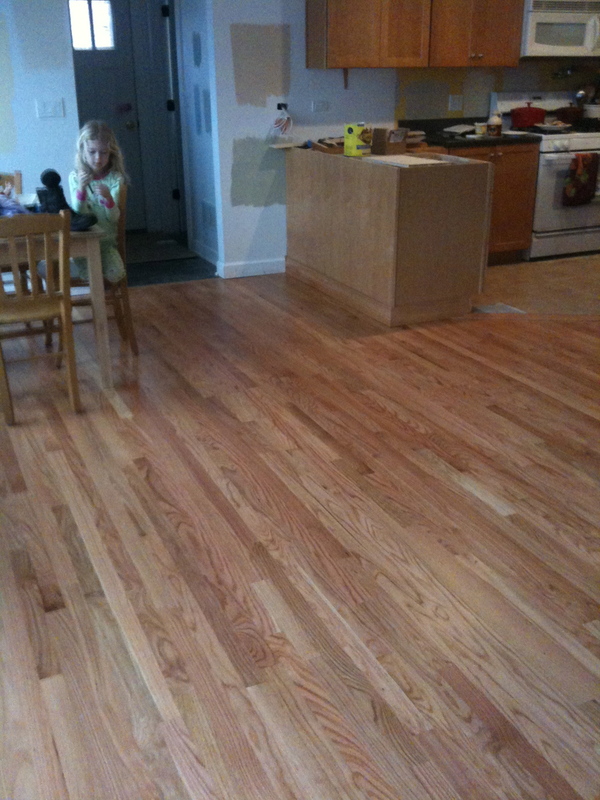 This was a big help to us since we were doing all the painting and didn’t have time to get the priming done before the floors were to go in. 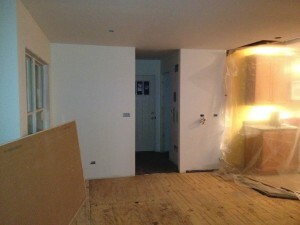 You can see the subfloor in the picture above and the temporary wall between the kitchen and family room. 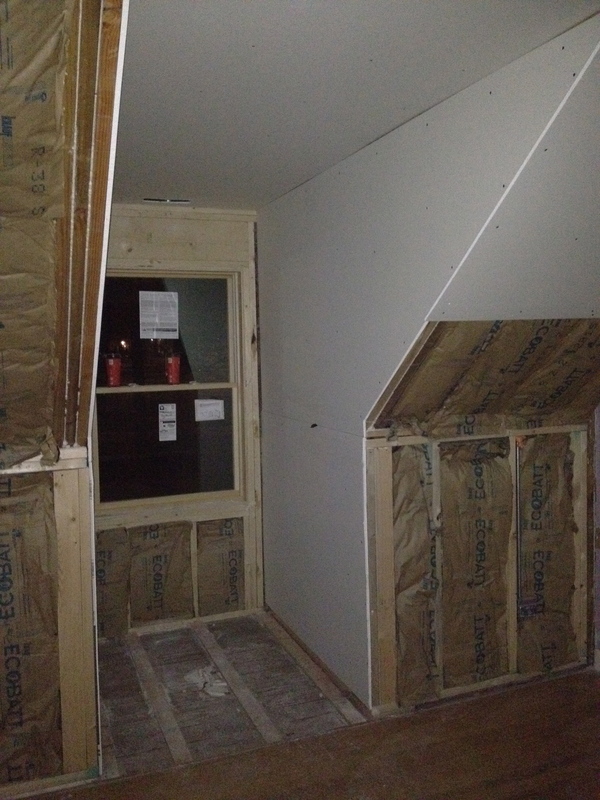 The kitchen was about 1/2″ higher, so a threshold was needed there. Once the walls were primed, down came the temporary wall and the floors were built up to match the level of the dining room. Upstairs the subfloors were installed and then the wood floors were installed. 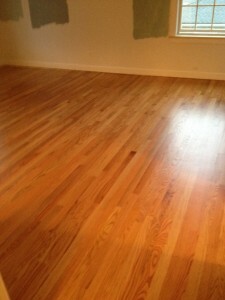 This took about two days for installation and sanding, then about two days for staining and sealing. 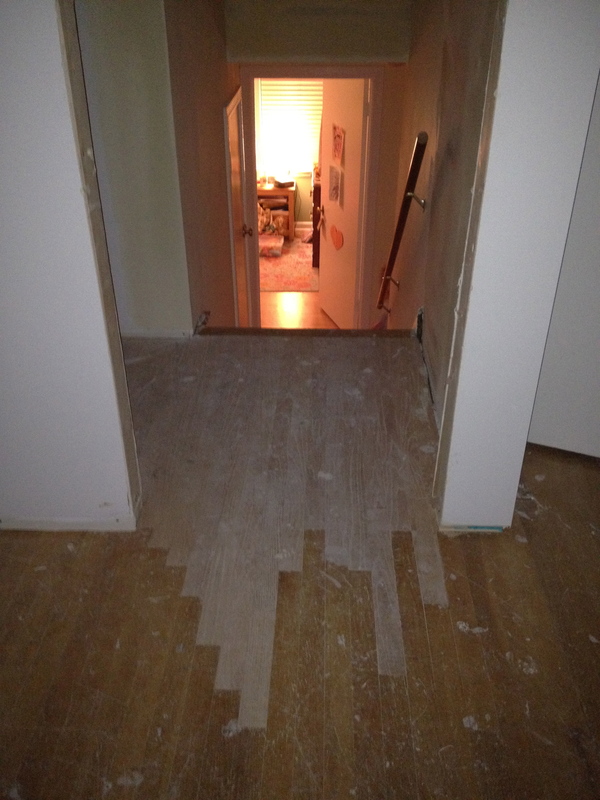 Upstairs, the bedroom floor with existing wood had to be joined with the new hallway. Before sanding the differences were obvious. 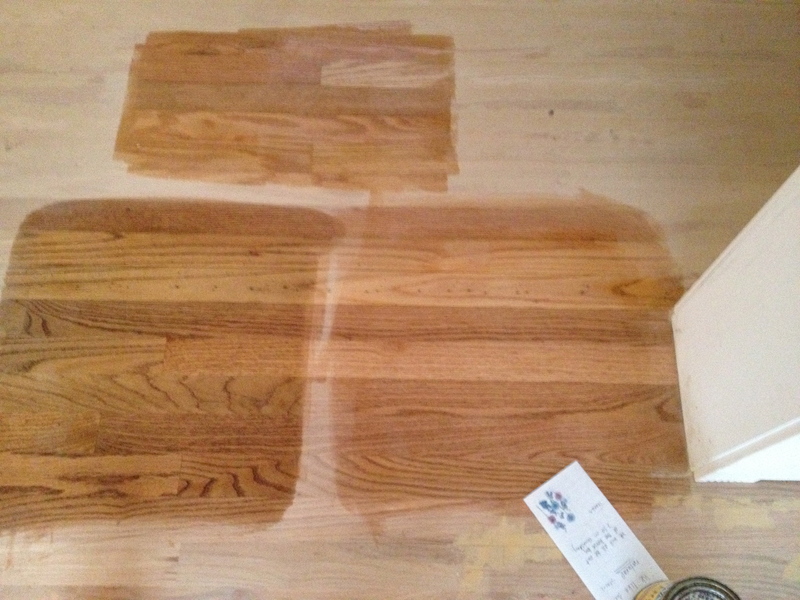 We had a few choices on stain, we decided to go with the lightest natural color which most closely matched our existing flooring. We didn’t have the old two bedrooms refinished, so we needed to be closer. 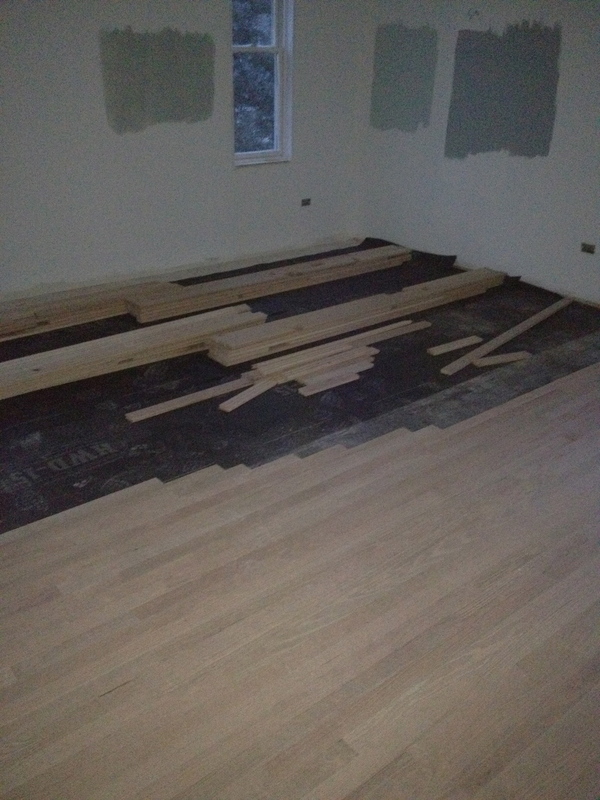 We also didn’t have any room to put all of our stuff so we had to cram all of our furniture into the kitchen, bedrooms, and basement during the four days of floor refinishing. 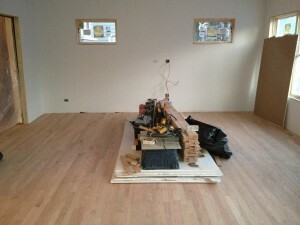 We spent the night in a hotel and came back the next morning to ventilate the house and start moving furniture. The results were pretty dramatic to say the least. The house could finally be cleaned and stay reasonably dust free from that point forward. 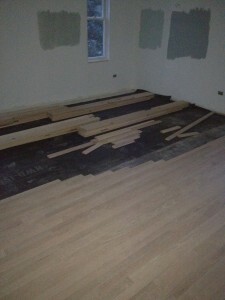 One thing that I really noticed about the flooring after it was done was how solid the builder had made it. There is no floor creaking in any of the new areas of the house. We will have to see if this will be true years from now, but I realized how used I was to hearing loud floor creaks whenever I moved around the room.